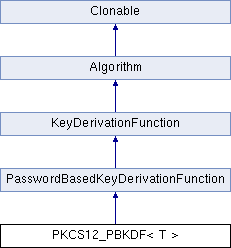 PBKDF from PKCS #12, appendix B. Definition at line 303 of file pwdbased.h. Definition at line 315 of file pwdbased.h. Definition at line 360 of file pwdbased.h. Definition at line 368 of file pwdbased.h. Derive a key from a secret seed. If timeInSeconds is > 0.0 then DeriveKey will run for the specified amount of time. If timeInSeconds is 0.0 then DeriveKey will run for the specified number of iterations. Definition at line 389 of file pwdbased.h.